Australian/New Zealand owned cafe shops List. Daisy Green / Beany Green / Timmy Green, Brunswick East Coffee, Barossa Fulham, Flat White, Lantana Cafe and Kaffeine. Daisy Green : Serves breakfast, healthy lunch and Aussie inspired sweets. Available for private hire in the evenings (max capacity 120 standing). Beany Green Coffee : Gourmet coffee with homemade delights, pastries, a selection of teas and hot chocolate. London W2 6EZ, United Kingdom. Timmy Green : Australian, Barbecue, Asian cuisines. Australian Coffee Shop in London, United Kingdom. Serving Alchemy Coffee, Brunch, Lunch, Pastries, Cakes and Smoothies. Address : Unit 3D Stamford Works, Gillett Street, Dalston. N16 8JH. Coffee House and Australian Kitchen. Serves espresso coffee, loose leaf teas, seasonal fresh food and baked items. 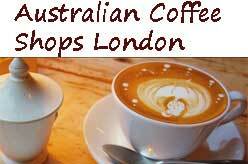 Australian and New Zealand cafes to London. Address : 17 Berwick Street, London W1F 0PT, United Kingdom. NOTE: after 3.00PM, takeaway coffee & food are served from Lantana In next door. An independent Australian/New Zealand owned cafe and one of the leading cafes in the UK for its high standards professionally made espresso coffee and loose leaf teas, seasonal fresh food and baked items, service and decor. Serves breakfast, lunch and coffee. Updated : 30 Novermber, 2017.